Halloween is just around the corner so we thought you might enjoy a little history about this spooky holiday. Interestingly, many of today’s traditions actually have a base in history. Enjoy! Often used as symbols of bad luck, black cats grace many Halloween decorations. The black cat's bad reputation dates back to the Dark Ages, when witch hunts were commonplace. Elderly, solitary women were often accused of witchcraft, and their pet cats were said to be their "familiars," or demonic animals that had been given to them by the devil. Medieval folklore also described bats as witches' familiars and seeing a bat on Halloween was considered to be quite an ominous sign. One myth was that if a bat was spotted flying around one's house three times, it meant that someone in that house would soon die. Another myth was that if a bat flew into your house on Halloween, it was a sign that your house was haunted because ghosts had let the bat in. In the U.S., trick-or-treating became a customary Halloween tradition around the late 1950s, after it was brought over by Irish immigrants in the early 1900s. 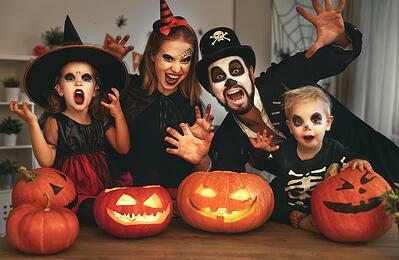 We hope that you will have a hauntingly delicious Halloween. When you have scary questions about insurance we can give you straight answers that won’t drive you batty.